Sensational Baked Blackened Shrimp Recipe is bursting with spicy delicious flavor and it’s so versatile. This shrimp recipe makes a quick and easy appetizer and is perfect in tacos, on salad, pasta or rice. You’ll love this healthy option and takes only 10 minutes to get these mouthwatering perfectly cooked shrimp to your table. Forrest Gump comes to mind when I think of shrimp. Because it’s true that it can be prepared so many different ways. We LOVE Blackened Shrimp. Well, maybe we just love blackened anything? Baking shrimp is now my go-to method because they’re perfectly cooked every single time. No more rubbery or mushy results…yuck. I’ve been up to my eyeballs in baked desserts lately. I guess our leaving Santa Claus a plate of cookies has morphed into a full dessert buffet. We do have a sweet tooth but after a while, I just get to feeling sick from overindulging. I don’t even have to eat that much. Just being around all of it becomes too much. So even though the holidays are a thing of the past for another year it doesn’t mean our social life goes dormant. We were invited to some friends house and everyone was supposed to bring an appetizer. I wanted something that would be delicious hot or cold. 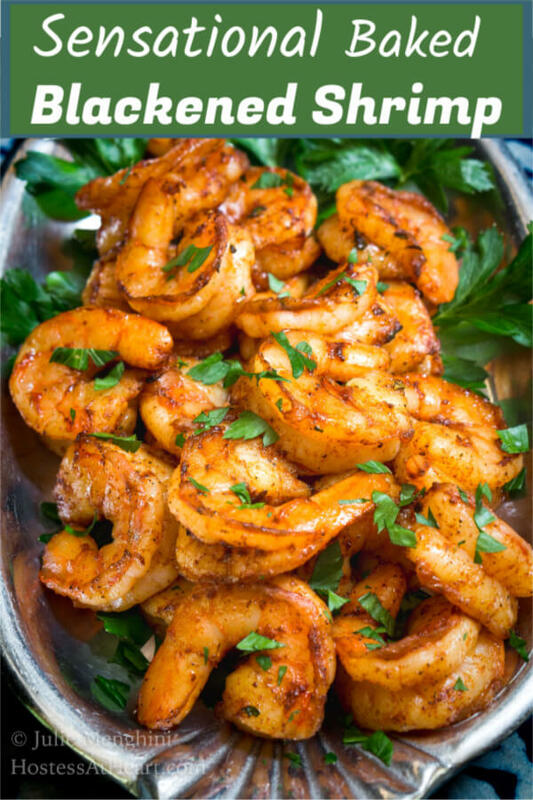 There always seem to be some dips and salsa appetizers so decided to take this spicy shrimp recipe. Little did I know there was going to be a contest of the most loved appetizer. This easy appetizer crushed the competition. Do you want to see my blue ribbon? Even though there are so many ways you can season seafood, blackened is one of our favorites. Blackened seasoning is usually associated with Cajun cooking. Blackened seasoning spices vary but are known to have a combination of herbs and spices. I prefer to mix up a lot of my own spices. You can easily buy a premixed blackened seasoning but I’ve tried so many that I finally made my own Homemade Blackened Seasoning Blend Recipe which is our absolute favorite. I know what’s in it and I can adjust the heat to our liking. What other dishes can I make with Baked Blackened Shrimp? There is not a live shrimp within a 1,000 miles of where I live. Here in the midwest, we buy it two ways. Frozen or previously frozen so I pick it up when it’s on sale and have it in my freezer year round. 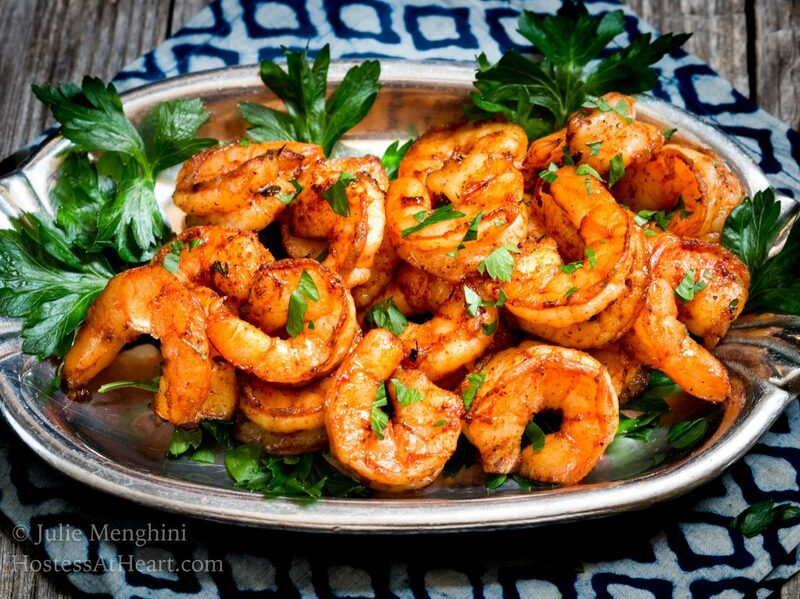 Shrimp is great to have on hand. If you have the option to buy fresh make sure that they don’t have an ammonia smell, are mushy or are falling apart…. I don’t think I even need to tell you this! I found a great reference from Alton Brown that has a wealth of information including regulation and sustainability information on shrimp. How do they determine the size of shrimp? Shrimp size is based on how many shrimp it takes to make a pound. While regulations vary, this is a general guide. As you can see there is some overlap. One of the first things that I consider when I’m buying my shrimp is size. I probably buy Jumbo more than the other sizes. They do shrink as they cook even though it’s a little less when they’re baked but I don’t want to have to search for a shrimp when I sit down to enjoy my meal or am grabbing my share from the appetizer platter. Save the shrimp peels and use them when you want to make a seafood broth or sauce. Just put them in the freezer for when you need them. It’s better to serve cooled shrimp than to try and keep them hot. They will just overcook and turn to seafood rubber. When making a seafood dish or soup add shrimp at the very end. Use a seafood broth to enhance the seafood flavor instead of relying on the shrimp to do it. The following are affiliate links. We are a participant in the Amazon Services LLC Associates Program, an affiliate advertising program designed to provide a means for us to earn fees by linking to Amazon.com and affiliated sites. You can read my full disclosure. Nordic Ware Natural Aluminum Commercial Baker’s Jelly Roll Baking Sheet – These sheet pans are durable and I have four of them. They work great for baking these shrimp or a ton of cookies! Tongs – We have several of these tongs. They are perfect for grilling, mixing and combining about anything. 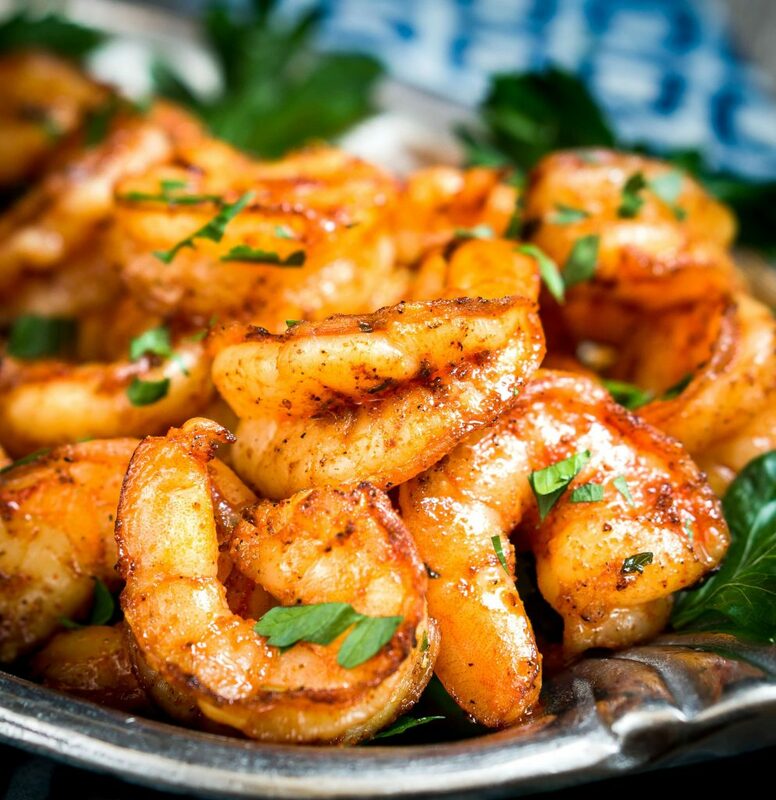 Sensational Baked Blackened Shrimp Recipe delivers a plump mouthwatering shrimp that is spicy red and will keep them coming back for more. It makes a great appetizer or is perfect for tacos or on pasta and waistline friendly! In a medium-sized bowl, drizzle raw shrimp with olive oil until they are lightly coated. Add blackened seasoning, and salt and pepper. Mix until coated. You can allow them to marinate in the refrigerator for 30 minutes or cook immediately. Lay shrimp on the prepared rack. Bake undisturbed for 8 to 10 minutes. Don't overcook. Garnish with the fresh parsley if desired. Serve immediately or cover and refrigerate. We enjoyed this shrimp so much and it’s an easy appetizer to make and take for entertaining like a New Years get-together or Superbowl party. It’s always good to have a balance of things to serve and shrimp is a great contrast to chips and dips or sweets. Baking them assures that they aren’t going to get overcooked. That’s my favorite way to cook them too. What are your favorite recipes for appetizers? I’d love it if you would share. I get such inspiration from you and appreciate your visiting me today! Now just like in Forrest Gump, there are a ton of shrimp recipes. Here are a few of my favorites! I just want to reach in and grab about 8 of these!! DROOLING! Shrimp is the perfect meal as an appetizer, main dish you name it. So smart to keep a stash in the freezer. Especially when you can whip up something this easy and delicious! Only ten minute? Crazy good! Pinned to make soon. Thank you, Debra! We love shrimp because they’re delicious even when previously frozen so we can enjoy them even in land-locked Nebraska! Thank you, Michele! Shrimp are a great way to eat clean without deprivation. It’s hard to eat well on the road especially when everyone is eating those delicious goodies! Thank you, Sandra! Happy birthday to your husband! What a great way to celebrate. I’m all over any new shrimp recipes that I can get my hands on, and this one is right up my alley! Love the fact that it’s so versatile… Shrimp tacos will be happening soon! Thanks, Julie! Thank you, Michele! We love shrimp tacos too and John would love these babies in a taco. It doesn’t get much easier than that Julie and shrimp is a favorite of most people. Thank you Karen! If I have shrimp I have an appetizer or delicious meal. We really enjoy it. Thank you for stopping by and have a great weekend! Thank you Mimi! I just love working with shrimp. They marry to other flavors wonderfully without losing their own flavor too! Shrimp is “sensational” in any recipe 🙂 I love spicy food and this shrimp in tacos would be good. Thank you, Judi! Shrimp are so versatile and sure make an easy meal! I love this blackened seasoning, so I know that these shrimp are amazing. Yum! Thank you, Debbie! I love them year round but summer on your new deck would be the best! Wow! This is definitely a sight for sore eyes Julie! I can’t believe those were frozen, I love how large they are. I was just preparing a post for this week and funny how I mention in my post that I had frozen shrimp in the freezer, but not anything like the size on your plate 🙂 Maybe I just didn’t look at the larger ones. Love anything blackened, well done! Thank you, Loretta! I’ve started looking for those larger ones because they cook up so nicely and they’re definitely a meal. We must have been channeling shrimp vides to each other LOL!